The art of relationship management is not new and can be found in many forms, addressing specific constituency relationships like business to customer, non-profit service organization to donors and political parties and candidates to voters. In the business world customer relationship management (CRM), focuses on business success by maximizing an organization's ability to identify and track customers' needs and behaviors in order to develop stronger relationships with them. 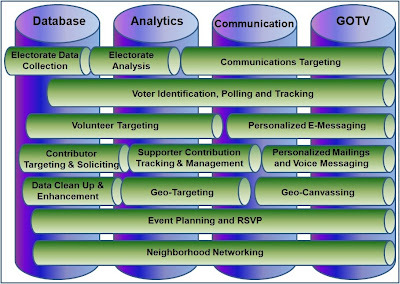 In the sphere of politics and non-profit organizations a Constituent Relationship Management (CRM), similarly focuses on electoral success by maximizing a party’s or candidate’s ability to identify and track voters' views and behaviors in order to develop a relationship with them and motivate them to vote. Just as Customer Relationship Management has been automated through software systems over the last two decades, Constituent Relationship Management has also been automated through software systems. Constituent Relationship Management is sometimes alternatively identified as Voter Relationship Management (VRM). Just as Customer Relationship Management systems help businesses better interact and communicate with customers, a VRM system can help a candidate or party better interact and communicate with the electorate. A VRM system can help candidates more effectively craft and communicate their campaign messages to selected voters in targeted geographic areas to solicit support, contributions and ultimately votes. The most successful political campaigns of the past several election cycles assemble and use many pieces of information about the electorate from many different sources. Increasingly, candidates and political parties are using computerized VRM systems to manage, analyze and efficiently utilize the information consolidated in their VRM database. VRM analytical functions help utilize the data to better communicate with and mobilize supporters and voters. Candidates and campaign strategists can comb through the data to obtain a holistic view of the electorate to identify supporters, solicit campaign contributions and pinpoint geographic areas (neighborhoods) for increased canvassing and GOTV efforts. Democrats were successful in the 2006 and particularly the 2008 election cycles because they began utilizing information about the electorate, just as Republicans have for the last decade. Over the last two election cycles Democratic candidates gained an edge against their Republican opponents because they use technologically advanced VRM web portals to more effectively connect with the electorate. Today's VRM web portals are increasingly designed and build by political IT experts to function as a multi-media communication and voter outreach channel with a social network, chat rooms, newsgroups, discussion forums, blogs, voter canvassing and advocacy tools, e-mail campaigns, e-newsletters, and more -- all aimed at actively facilitating calls to political action. VRM analytics can yield a broad understanding of not just of a voter's voting history, but also the profile of the household in which the voter lives and the ability to predict each household member's likelihood to support or oppose a candidate or ballot measure, contribute financially or volunteer. VRM analytics have also allowed voter communication campaigns to evolve from generic blasts of snail mail or e-mail into highly targeted, personalized outreach to each individual voter. VAN –– The Voter Activation Network was built by a private Boston-based company of the same name with partner Blue State Digital, another Boston-area company founded by veterans of the Dean campaign. At the foundation of VAN system is a national database of voters’ voting history and contact information that was originally populated with data from Howard Dean’s 2004 presidential campaign, data from legacy DNC DataMart and Demzilla voter files and other voter history data sources. VAN is primarily a database with a web front-end that provides data sorting, searching and reporting functions to slice and dice the data. VAN, now in its fourth major generation, does not yet provide analytic capabilities. VAN is available to Democratic Party affiliates in all fifty states as the DNC’s VoteBuilder web application. VoteBuilder –– VoteBuilder is the DNC's branded version of the VAN data access web application for data sorting, searching and reporting slice and dice functions. The DNC makes VAN data available to all 50 state party affiliates, local democratic candidates and national Democratic candidates through the VoteBuilder web application. PartyBuilder –– PartyBuilder is the DNC's social networking system designed to offer most of the functions found in commercial social networking systems such as MySpace and Facebook. Catalist –– Catalist, a private data company run by Harold Ickes and Laura Quinn, maintains detailed information on 280 million Americans, nearly every registered voter and eligible voter in the United States. The Catalist database includes information on how people vote, how often they vote and what motivates them to vote. More than 90 groups subscribed to Catalist data in 2008, including the Obama campaign. Catalist appends a unique identifier to each name as it flows through its master national file -- and this allows the various data silos to be synced and in effect "talk to each other." Strategic Telemetry –– Ken Strasma's firm used data from a variety of sources to set targets and create the likely voter model used by the Obama campaign. The exact composition of that set of analytics and statistical model is a closely held secret by the company and Obama’s most senior advisors. MyBarackObama.com –– MyBO was developed as the web portal of the OFA campaign and functioned as the volunteer social networking mobilization and fundraising hub of the campaign. MyBO provided the communication channel and organizing tools seen and used by campaign staff, field organizers and volunteers, In January 2009 MyBO was handed over to the Organizing for American organization as a subsidiary of the DNC. The Obama campaign and Strategic Telemetry processed all this collected data through Strategic Telemetry’s analytics and statistical model software system to track the electorate’s key issues and create targeted persuasive messages for the campaign and the candidate to communicate back to the electorate. Credit: Technology Review / Thursday, December 18, 2008. One side effect of Barack Obama's Webcentric presidential campaign is that it helped turn the Democratic National Committee's voter database--information on the political leanings and interests of millions of U.S. citizens--into a far more potent political weapon. In the final two months before Election Day, 223 million new pieces of data on voters accrued to the database, and the DNC now holds 10 times as much data on U.S. voters as at the end of the 2004 campaign, according to Voter Activation Network (VAN), a company based in Somerville, MA, that builds front-end software for the database. Such information could prove vital for future elections in that it shows where to allocate resources most effectively--particularly when it comes to voters who are wavering between parties--and what kinds of messages will appeal to specific voters. While some of 223 million pieces of data added in the final stretch of the campaign are not particularly useful (it includes canvassers' or callers' notations that a voter "refused to talk" or "wasn't home"), overall, it's a gold mine, says Mark Sullivan, co-founder of VAN. "The data collection in 2008 was a quantum leap from where we were in 2004," Sullivan says. "It also means that we start the 2010 cycle with vastly more knowledge about who voters are, and how we can best communicate with them, rather than feeling like we have to start all over again." This information could perhaps even help Obama govern if the DNC decides to ask average Americans to contact members of Congress about specific policy efforts related to, say, energy, health care, or the Iraq War. The VAN database--Sullivan would not describe its exact size, but there are about 170 million registered voters in the United States--can be used by all Democratic candidates in national or state elections. In the case of primary campaigns, new data collected by a Democratic combatant is kept by the candidate and added to the national database after a winner emerges. While most campaigns add something to the database, the biggest contributor this year was, of course, the Obama campaign. For example, tens of thousands of times, volunteers logged in to Obama's social-networking site, my.barackobama.com (MyBO), and downloaded small batches of voter names and phone numbers, dialed them up, and followed various scripts. The aim was to learn their political and issue leanings, encourage people to vote for Obama and to ask supporters to make sure they go to the polls. These responses were recorded by the volunteers using a Web interface, adding to the database instantly. In the final four days of the campaign alone, four million such calls were made through MyBO, says Jascha Franklin-Hodge, cofounder and CTO of Blue State Digital, which built MyBO as well as the interface to the VAN voter list. "This was just using our tools in that short window of time--never mind what the actual field organization was doing on the ground," he says. MyBO was hardly the only source: the DNC, local campaign offices, traditional phone banks, and canvassers also added data in various ways. Beyond the data gathered on voters, the Democrats and Obama also have access to a network of willing volunteers who can be used to recontact voters. "They've got a whole volunteer structure that gathered all this information that can be put to used in the 2010 midterms, and can hopefully be available for a reelection [of Obama]," Franklin-Hodge says. "There is a tremendous amount of data mining and analysis that goes on within the party and political organization that allows a better understanding of how people vote and how they make decisions." This approach--"micro targeting" voters based on their feelings toward specific issues--was once the domain of the Republican National Committee. But even leading Republican figures now acknowledge that the days of GOP voter-data dominance have ended. "For decades, the RNC has had a significant advantage in their voter file, and in their ability to identify and turn out voters," says Mike Connell, founder of New Media Communications, an Ohio-based Republican new-media firm. "With the Obama campaign and the efforts over the last couple of years, [the Democrats] have made significant strides and have caught up." A key reason for the DNC's data advance was a decision by DNC chairman Howard Dean to improve data sharing among Democratic organizations at the state level. "Four years ago, Howard Dean 'got it,'" Connell says. "Not a lot of people give him credit, but he made a transformation." Since then, the DNC and VAN have steadily improved the database interfaces. This year, the newest tool in the arsenal was a Google Maps application developed by VAN that makes it far easier to chop up lists of voters in specific precincts for canvassers to personally visit. In the new application, called "turf-cutter," voters' homes are displayed as icons on a map. A few clicks of a mouse allow organizers to draw boundaries around clusters of voters' homes and print out the resulting list for volunteers. In the past two months, Sullivan says, activists from all Democratic campaigns have used this application 948,000 times, saving thousands of hours of man power, compared to manually figuring out how best to chop up a given district and dispatch volunteers in the most efficient manner. "Probably, on average, for each precinct, they would work with maps and highlighters," says Sullivan. "I hear all the time, 'That was a 45-minute job,' and now they go in here and it takes a minute or two. It was the biggest bottleneck."